The absorption period can be critical for a DUI defense if you just finished the last glass of wine or had one final beer right before you got in your car and drove. So, if a DUI arrest occurred within a short amount of time after you finished your last drink you may have an absorbing defense. 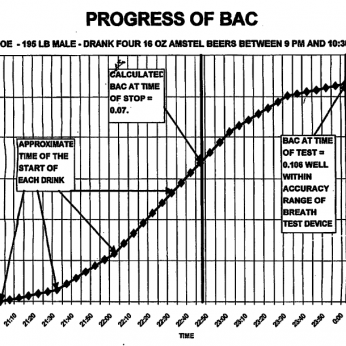 This means, although you may have given a chemical sample of blood or breath that was determined to be above the legal limit, if you were in the absorption phase your BAC may have actually been lower while you were driving. This is critical because unlike many other States, in California it’s your BAC at the time of the driving, not the time of your test that matters. In some cases the absorption period can be very short (gastric bypass) or delayed up to 2 hours (Thanksgiving Dinner). There may be several physical, medical and social factors that could affect a person’s absorption time. This is critical because alcohol that is still in your stomach at the time of your driving does not impact your BAC level or your ability to drive. It is therefore likely that if you are in the absorptive phase, your blood alcohol level will continue to rise during the time that the officer is asking you questions, performing field tests and then administering either a breath tst or a blood test. The attorney’s at the Law Office of Barry Simons are experienced and qualified to review your case and determine whether you may have been absorbing alcohol prior to your arrest or even while you were giving a breath or blood sample. The absorption defense may also require experts in the field of pharmacokinetics that could testify or present a defense on your behalf by way of your attorney at the DMV Admin hearing or at court for your criminal proceedings. The attorneys at the office of Barry T. Simons are familiar with many professionals in this field and that have provided successful absorption defenses for our past clients that resulted in reductions of charges, relief from a DMV suspension, and even a dismissal of the DUI charges.